These 1" White Half Size Avery Economy View Round Ring binders provide an excellent quality presentation binder for an economic price. With these 1" white half size binders you can discover the sturdy simplicity in a convenient and lightweight package. Featuring high quality non-locking round rings, these 1" white half size binders are easy to open and close so that you can add or remove papers as needed. Designed for use with 5.5" x 8.5" half letter sized documents, they have two pockets to hold handouts, pamphlets and other loose or un-punched paperwork for quick access. Plus, these 1" white half size binders have a clear overlay on the front, back and spine allowing you to fully customize the binder. Avery 1" White Half Size Economy View Round Ring Binders are an excellent choice for light use and for presentations or training materials that will be distributed to employees or clients. Product number AVE-05806. We need these at our Church. They are great for keeping our weekly notes organized!! I purchased these view binders to place a family cookbook I had typed and printed in. It is a great product and fits my needs just fine. Transcript: These are Avery Economy Ring Binders! They come in several sizes ranging from 1/2 an inch to 3 inches. The non view binder is quite simple, though there is an option for a label holder on the side. The view binders have a clear plastic cover in which you can slip in an page—or pages, and you can do this on the front, back, and side. The rings on these binders are round. There is a pocket on the inside of both covers, perfect to fit 8.5 x 11 inch paper. 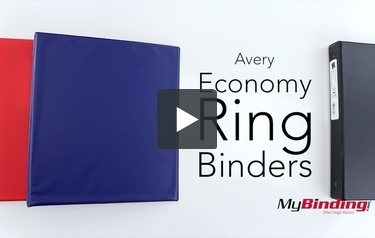 These are Avery Economy Ring Binders! Use the side tabs to open the binding rings and insert your 3 hole punched pages, the amount of pages you can hold depends on the size binder you purchase. You can press on the center ring to close them up, or push the tabs in.